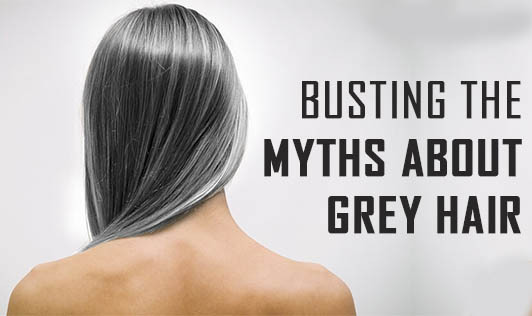 No- once the hair color is produced by the follicles it can't actually change, so it cannot just turn grey with stress. Once the hair strand grows out, it stays the same color. However hair follicles begin producing less color as they age, so they might look a little lighter as you get older; but they never change colors. No- our body don't just add the number of follicles, and pulling out a grey hair will certainly not cause more grey hair. However it has been found that sometimes due to some undetermined reason one can have more than one hair growing from the same follicle. Yes- if your parents or grandparents went through early graying then, chances of you graying early are high. Ethnicity also plays a role in determining how early you begin to gray. It has been observed that Caucasian people tend to grey faster and earlier than Asians and blacks. No- Not unless you purposely dye your hair grey. Your hair will always grow back in its natural color whether it's grey, black, brown, or blonde. Yes- studies suggest that smoking can start graying you're hair even before the age of 30.